In the 1990s papaya ringspot virus was in the process of wiping out the Hawaiian papaya industry, then the second largest fruit industry in Hawaii. Conventional approaches such as selective breeding for resistant papayas or attempting to grow trees in isolation had failed. The virus is transmitted by small sap-sucking insects such as aphids. Infected papaya trees can be recognized by the discolored rings on their fruit (that the virus gets its name from) yellow leaves, and most importantly from a papaya farmer’s perpsective a 60-100%* loss of fruit production. 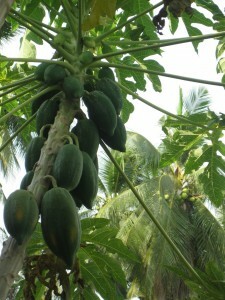 The papaya was originally domesticated in central America, and is now grow around the world. 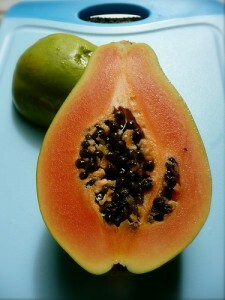 Papaya’s actually have a high concentrations of an enzyme that breaks down proteins called papain. A sufficiently concentrated extract might be able to dissolve flesh (though I don’t know that anyone has tried it) and that ability is showcased in the use of unripe papaya juice to tenderize meat. It is time to meet the press. Although scientists are not generally trained in media communication, who is better qualified to discuss the risks and benefits of GE crops? If scientists do not undertake this task, where will the public get its information? If the next generation of biotechnology crops is to make an impact on those who arguably have the most to gain and have yet to reap the benefits of the first generation—those of the developing world—then it is time for plant biotechnologists to move beyond the bench, kick around in some barren soils, man a water buffalo for a day, meet the people whose lives will be impacted, and display the same amount of passion for having their technology used in the field as they have for developing it in the laboratory. It is time to get organized, get political, get heard, and get out of the lab. Otherwise, the fruits of this fascinating research may remain forbidden. *Losses of production per country or per region are often much greater. If papayas are less productive, fewer people will choose to grow them, so increasing yield per plant actually has a multiplicative effect as more people get back into the growing papayas. **The original gene gun was basically a modified .22 caliber rifle. The principle of a gene gun is basically if you throw DNA hard enough at a layer of cells some of it will end up in the nucleus and get incorporated into chromosomes by natural repair mechanisms. And the crazy thing is that it actually works! Posted in: agriculture, Crop Profiles, Feeding the world, Plants. This is a great series. I was wondering if you had or know of a good list of all the transgenic crops and/or transgenes that are on the market or even in testing etc. Just looking for a localized resource. It’s a good question and I haven’t been able to find a single definitive resource, though I’m sure they do exist. One you might find useful is this list, however it’s both incomplete (I think it only includes products produced by members of the biotechnology industry organization, inaccurate (I can’t find any outside confirmation for the products on that list developed by Mycogen) and out of date (sugar beets resistant to glyphosate have been both released and sued off the market but as still listed as in development). Any other readers have better suggestions? That would be a helpful list. I hear all the time “nobody can buy any seeds that aren’t GMO” and then I ask for a list of what they have been unable to obtain. It would be fun to have the list of existing products and ask them if this is all they intend to grow. Well the idea of this series is that at the end I’ll have a list of every crop known to be genetically engineered (not that many). And anyone who claims something else is genetically engineered will have to provide sources to back themselves up. Yeah, I get that “nobody can buy seeds that are not GM” I am quick to respond that growing up on a seed corn farm and knowing the industry fairly well, there are defiantly non-GM varieties available(often the only difference is the GM trait). Admittedly there is more incentive to sell the GM lines. If a farmer wants non-GM seed (and I can only really speak to Ag in Ontario) and is semi-competent, they can get it. Goes to show how much misinformation on this subject there is. thanks for the link, i think it will be very useful.